It is high time now that we shift to mobile ticketing solution for our regular commutes. The main disadvantage of paying with cash while traveling is the problem of ‘change’. This can be totally solved by using electronic mode of payment such as e-wallet. 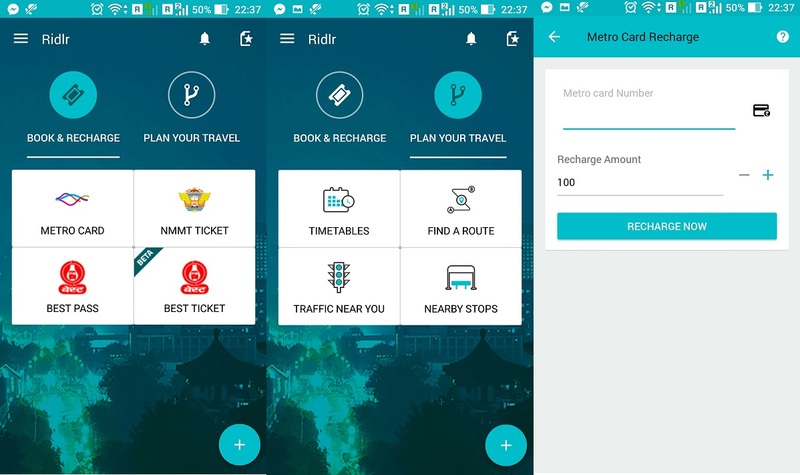 Ridlr introduces BEST bus mobile ticketing feature which will allow the commuters to pay using the mobile wallet. The way in which Ridlr mobile ticketing works is not the usual one we use to pay over the internet. So let us understand what are the different features Ridlr offers, and how to use them to simplify our day-to-day life. Please note that this post is especially useful for people living in Mumbai. 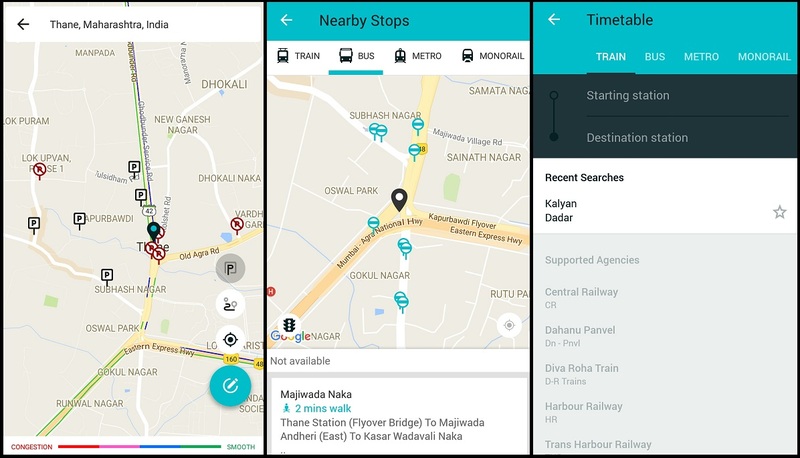 People living in other cities can use Ridlr to see offline timetables for their respective modes of transport. Currently, Ridlr is available only on Android platform & you can download the app from HERE. Ridlr supports two e-wallets as of now viz. Freecharge and Citrus. All the payments will be deducted through these wallets and you need to recharge it as and when required. Mobile ticketing system for BEST, NMMT is only available for selected routes and AC buses only(This was the current pilot test). Now they have the approval of BEST to make this service available for all 4000 buses traveling across 365 routes. So we can expect the same after their official launch i.e. on 10th Dec 2016. Overall the app is really useful to get instant updates and information about your city transport. So let us check out the mobile ticketing feature for BEST buses which was recently introduced and is currently in the Beta stage. Offer: Starting from 10th Dec, First 10,000 customers to travel free for a week and will be receiving up to Rs.100 credit. So make sure you sign up for the service as soon as it starts. 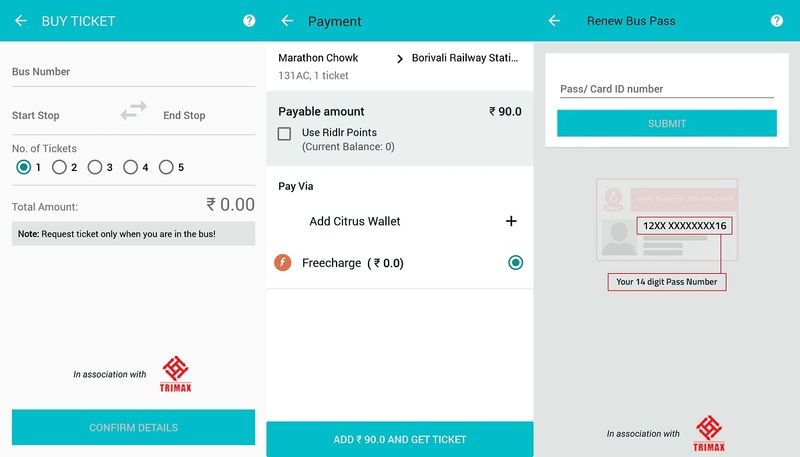 How to pay for BEST bus ticket using Ridlr? Download and install the Ridlr app. Link your Freecharge or Citrus wallet for payment. Tap on the BEST ticket tab. Select the bus number. Choose the start and end stop from the list of all stops. Select no. of tickets to purchase and confirm the details after checking the total amount. Now you will get an option to generate a token which you need to share with your bus conductor. Using this token the conductor will approve your ticket request and the payment will be deducted from your wallet. So the token system is quite new but you will get used to it. Same thing needs to be done once you get a pass renewed using the Ridlr app. The conductor needs to approve the pass within 3 days. We will update you with perfect guidelines once the app is officially launched. This is definitely something you need to try and use it on a regular basis especially in the demonetization scenario. Just start using mobile wallets and see how convenient it is. If you have any doubts please post them in the comment section below. Let me know what do you think about this app, and whether you would like to switch to a cashless mode of payment or not. I have done the recharge of 200 /- rupees and it is debited from my bank account but I have not got points/balance in Ridlr app. Pls suggest to whom shall I contact for this issue? What is the customer care no of Ridlr. I don’t think Ridlr takes any of your money. You have option to add money directly to the wallet provided by Freecharge and Citrus. So check the balance of the wallets or else contact the wallet support for any issues. I hope this helps. Search in the store. Or else you will have to wait till they officially launch it. I want to change my freecharge account as the old number is not available with me anymore. Please help as there is no option to remove the old one. Hello. You can surely contact FreeCharge support for help. I am sure they will help you out. Thank you for sharing your feedback Dhiraj. I will be sharing this with the Ridlr team, you can also send them an email with the issues you faced. I hope they fix this issue very soon. You will need the mobile phone to validate the ticket. It is just like carrying your pass or ticket virtually. Without that I don’t think they have any alternatives as of now. I have linked my Paytm Account with Ridlr, but its not showing any balance in Ridlr’s Paytm Wallet whereas I am having balance in my Paytm wallet. I have download ridlr app, when try to login at referral code click it shows message ridlr has stopped and at down open app again or send feedback. I have already send feedback but there is no reply. Try emailing them or may be posting review on playstore about that app. If that helps. If I can get in touch with the team then will let them know for sure. I bought mobile pass from dindhosi to malad depot. Can this pass help me in returning time from malad to dindhosi, or i have to buy ticket for that. If you are talking about daily pass then you can make the return journey with the same pass also. Hi sir I have downloaded this app and now I have a mobile pass with this app …when i validate the pass it showing that “Look like you are not in bus.You can only buy ticket while in a bus.” but I’m already in a bus.Kindly provide solution for this. Hello. Make sure that GPS of your phone is working properly. That might be the reason you were not able to validate your pass.